Oregon U.S. Wine Sales Near 3 Million Cases According to Impact Databank, Oregon wine sales reached 2.9 million cases in 2015, led by Pinot Noir and Pinot Gris that accounted for respectively 55% and 25% of volume. 90% of sales are above $11 a bottle, indicating Oregon has now become an important player in the premium wine market. Millennials, in particular, seem to include Oregon along with Washington and New York in their wine purchase choices. According to the Oregon Wine Board, 70% of Oregon’s 676 wineries produce less than 5,000 cases annually. Shanken News Daily notes that the upscale skew in Oregon wine prices can also mean higher operating costs for wineries since growing cool climate Pinot Noir is a costly proposition. Because of large vintage variations and low yields, it is challenging for Oregon to keep price and quality consistent. Oregon Lags in Monthly Visitors Oregon’s wineries are near the bottom in average monthly visitors per winery in the United States. 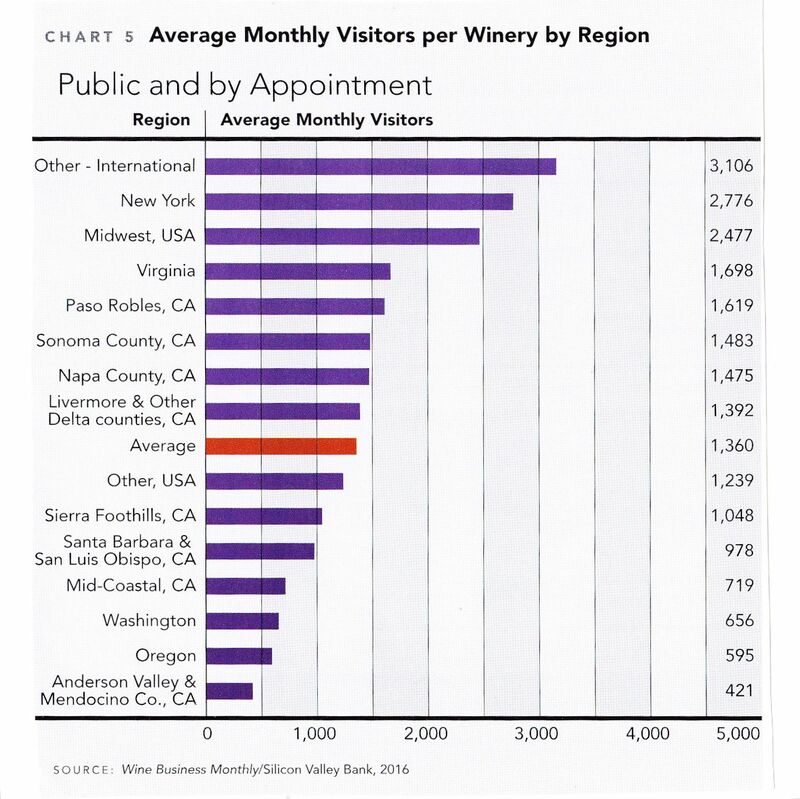 This is advantageous for visitors, because wineries tend to be both receptive and attentive. Helicopter Wine Tours Gain Popularity in Oregon According to an article in the Portland Tribune (March 8, 2016), helicopter tours for tasting are now more affordable and thus more accessible. Tour DeVine by Heli charges $399 per person for a 4-hour tour that includes 90-minute stops at two different wineries in a single AVA as well as morning champagne and snacks and a boxed picnic lunch by Red Hills Market. There are currently over a dozen winery partners allowing guests to customize their tasting tour. Visit www.TourDeVinebyHeli.com. Oregon’s Other Pinot Noir Region Southern Oregon is an officially designated American Viticultural Area since 2004, and is home to about 100 wineries and 3,000 acres of vines spread throughout the Rogue, Umpqua, Illinois and Applegate valleys that dot the landscape from Roseburg south to Ashland. One of the best kept secrets is that a number of Willamette Valley wineries source Pinot Noir grapes from the Umpqua Valley and Rogue Valley, especially in challenging cool vintages since these more southerly regions are warmer and can be more productive in certain vintages. Of the 29,000 tons of Pinot Noir crushed in 2012, 1,436 tons came from the Rogue Valley and 901 tons from the Umpqua Valley. Pinot Noir producers in Southern Oregon that are worth a visit include Brandborg Winery & Vineyards, DANCIN Vineyards, HillCrest Vineyard, Reustle-Prayer Rock Vineyards and River’s Edge Winery. Some Oregon Vineyards On Borrowed Time Phylloxera is a widespread pest in Oregon vineyards and once it gets enough presence in a vine, it is impossible to eradicate. Oregon fights to save its pest-ridden vineyards, since these vineyards are own-rooted, and many vintners feel own-rooted vines make the best Pinot Noir. Most of these own-rooted vineyards were planted before 1980, while the majority of Oregon’s vineyards planted since are on phylloxera-resistant rootstock. Phylloxera showed up in Oregon in the late 1980s. Phylloxera is not the only pest wine growers are facing. According to an article in the May 1, 2015 issue of Capital Press, Oregon State University’s Wine Research Institute has issued a warning that Oregon wine grape growers can expect increased pressure from brown marmorated stinkbugs in particular and spotted wing drosophila to a lesser degree. Both pest feed on tree fruit and berries (including grape berries) and are two of agriculture’s most damaging pests. Sta. Rita Hills Wine and Fire Event The 2016 Sta. Rita Hills Wine Alliance’s annual event, Wine and Fire, will take place August 5-7 at multiple locations throughout the Lompoc Valley. Year 2016 marks the 15 year anniversary of the Sta. Rita Hills AVA designation. Over 40 Alliance members will participate in three events over the weekend including the Friday night Barn Party at Hilliard Bruce Vineyards, the Saturday morning seminar on vineyards on Highway 246 and a look back at the past 15 years of the AVA, also be at Hilliard Bruce Winery, and Saturday evening’s Grand Tasting at La Purisima Mission. Alliance members will also be hosting open houses and special events throughout the weekend. For details and ticket information, visit the Wine and Fire page at www.staritahills.com. California Wine Institute Santa Cruz Mountains Road Trip The Wine Institute’s California Wines Road Trips series highlights a different region each month. This month, Santa Cruz Mountains is featured. 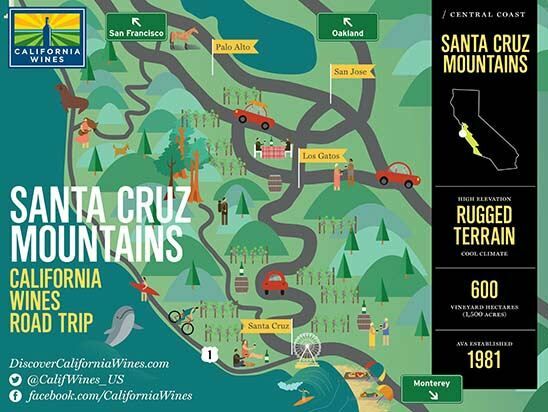 Home to more than sixty wineries tucked into hillsides, Santa Cruz Mountains is one of California’s first AVAs (1981), and among the first to be defined by its mountain topography. This broad region is marked by diverse microclimates, with Pinot Noir and Chardonnay the stars on the coastal side and Zinfandel, Cabernet Sauvignon and Merlot predominating on the warm eastern inland side. There are several wine trails to explore, including the Summit to Sea Wine Trail, the Corralitos Wine Trail and the Saratoga Wine Trail. The beach town of Santa Cruz offers several urban wineries as well. Visit www.discovercaliforniawines.com for more information and an interactive map. Contact me for recommended Pinot Noir specialists in the region. Family Winemakers Tasting This extensive tasting of wines from smaller family owned wineries will be held August 21, 2016, at Pier 27 Cruise Terminal in San Francisco. This is an opportunity to taste over 500 wines offered by 125 wineries including upwards of 40 varietals or blends. Consumer tasting is 2:00 p.m. to 5:00 p.m. and Trade tasting is 12:00 p.m. to 5:00 p.m.. For information and tickets, visit www.familywinemakers.org. Delicato Family Vineyards Acquires River Road Vineyard Delicato Family Vineyards has acquired the historic 243-acre River Road Vineyard in the Santa Lucia Highlands from the McFarland family. This pioneering vineyard was first planted in 1972 by the late Jerry McFarland and was a forerunner of the current successful Pinot Noir and Chardonnay plantings in the region. It is located at the northern end of the Santa Lucia Highlands, bordering Sleepy Hollow Vineyard to the north and west (Sleepy Hollow Vineyard was also planted in 1972). The Indelicato family has a long tradition of grape growing in Monterey and their vineyards include San Bernarbe Vineyard in Monterey’s San Bernabe sub-AVA. What Yeast At Work During Fermentation? An interesting article appeared in the June 2016 issue of Wine Business Monthly (“Fermenting About Recent Yeast Research” by Curtis Phillips). University of British Columbia professor Dan Durall has studied yeast in winery fermentations for five years and presented his findings at the last Innovation + Quality conference. Durall found that an inoculated fermentation was usually dominated by the inoculated yeast strain, but about 30 percent of inoculated fermentations in his study ended up with some other commercial wine yeast strain forming 21 to 100 percent of the yeast population at the end of fermentation. Spontaneous fermentations always or nearly always ended up being a spontaneous fermentation of a commercial rather than an indigenous or “wild” yeast strain. Durall concluded that spontaneous fermentations are not “wild,” “indigenous,” or “native.” Instead, he suggested that the term “feral” was more appropriate. Curtis Phillips pointed out that spontaneous fermentations are usually dominated by whatever commercial wine yeast strains happen to have been used in or around the winery in the past. He also emphasized that inoculation with a commercial yeast strain is not a guarantee that the strain will be the one that ends up dominating a fermentation. Many wineries use the terms native, wild or indigenous to emphasize they do not add yeast to the fermenter, and this is often a marketing tool that suggests a purer, even more natural approach to winemaking. Durall’s research would seem to refute this idea that fermentations can be totally driven by wild yeasts that come into the winery on grapes or inhabit the winery (unless the winery has never used a commercial yeast and the vineyard is relatively isolated). I think I will try to use the term “feral” in my wine reviews in the future. ØENO (ee-no) Vaults Handles Wine Buying Logistics A cellaring solution that assists wine enthusiasts visiting Northern California’s wine country. Travelers can create an account through the web or mobile app, email Øeno Vaults the wine purchase orders or use the web or mobile app to submit wine pick up requests, and keep track of your wine inventory online or with OV Mobile. The wine is picked up from any area winery in a refrigerated truck and taken to the Øeno Vault facility. Each bottle is then inventoried, photographed and stored in an armed, climate controlled private vault with 24 hour surveillance and climate monitoring. Wines are then shipped to the customer from their vault wherever and whenever they wish. Tours of the facility are available. For information, visit www.oenovaults.com. Will the Bloom Fall Off The Pinot Grape?